Koh Phangan Tours. Koh Phangan is an island in the Gulf of Thailand in southeast Thailand in Surat Thani Province. It is part of the Samui Archipelago. It is famous for its Full Moon Party at Haad Rin Beach and as a backpacker destination. Ko Pha Ngan has two sister islands: the larger Ko Samui to the south and the smaller Ko Tao to the north. To enjoy Koh Phangan tours, is advised to visit during the full moon party period. The party takes place at the southern end of the island in the town of Haad Rin, a hedonistic party town made up of meandering side streets packed with bars, restaurants and gift shops, bungalow resorts to suit every pocket and above all else the stunning Haad Rin Nok beach. At the time of the full moon, Haad Rin is packed full of revellers and advanced booking is recommended if you wish to stay in this part of the island at this time of the month. 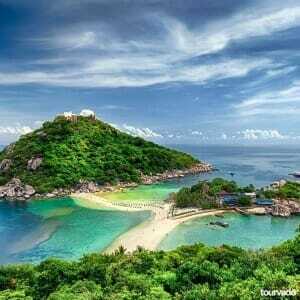 Koh Phangan tours is also enjoyed by visiting Thongsala. Thongsala is the only true town upon the island, a vibrant mix of Thai shops, western bars and restaurants along with traditional food markets at every turn. At night the main market square becomes an open air restaurant serviced by a couple of dozen street vendors who set up tables and ply their trade. Some of the best food on Koh Phangan can be found here after the sun sets. Thongsala also houses the main ferry pier for the island and forms a natural gateway to the mainland. Haad Yao and Haad Salad are some attraction site you should visit on a Koh Phangan tour, they are both excellent diving areas with a close in reef allowing easy access for beach dives. They are also the premier snorkeling spot on the island offering sites usually only witnessed by scuba divers. You can wrap up your Koh Phangan tours by visiting Chaloklam, a squid fishing village with a beautiful crescent beach. The seafood here is exceptional, taken straight from the sea each morning. At night you can watch the lights of the dozens of squid boats that ply the waters in this area, and then watch them return with their catch and dry it in the sun whilst you eat breakfast at a beachside restaurant.